After baking multiple batches of these over the past few days for myself and friends, I had to add the Tate’s Bake Shop Chocolate Chip Cookie recipe to the Top 10 list. If you like thin cookies with crispy edges, the Tate’s cookies are for you. Also, I tried making them with European style butter and they were slighly better, but not by much. Whoops! I meant to answer this question yesterday. About the butter, I usually use H.E.B. brand. It’s their “house” brand and I was told they have their own dairy. It’s about $2.00 a pound. If I’m going to splurge, I use Land o’ Lakes or Central Market’s European style. 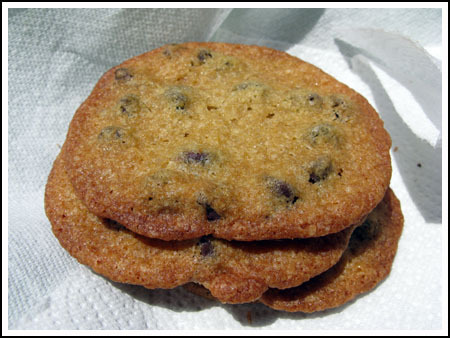 I’m going to bake these cookies right now to send my my mother-in-law (who loves Tate’s cookies). I’ll let you know how they turned out!! anna, when you use non-euro. butter, what brand do you use? to find a big difference in the results across the brands?